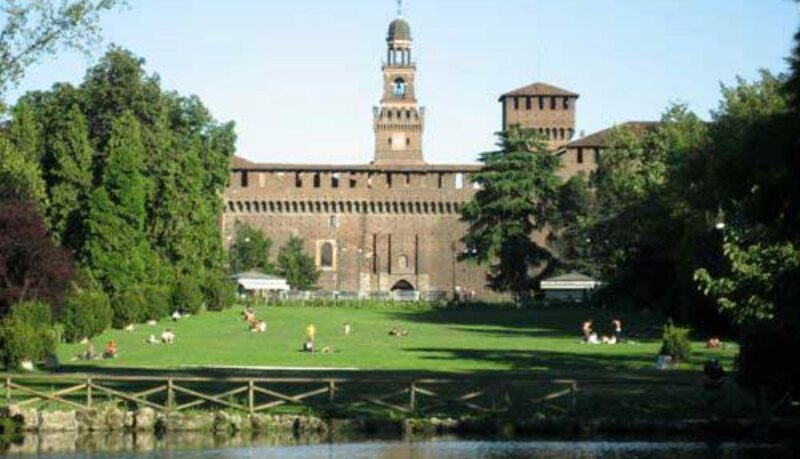 If you want to relax a while you’ll be surprised to find this very large and nice park almost in Milan city center, behind the Castello Sforzesco . You can sit in the shade of the trees on the lawns or on one of the many benches, and see the Milanese pass by. Italian city centers most often do not have large green areas, so Milan is lucky to have this ‘lung’ where you sniff some fresh air. Sometimes in summer a real necessity because of the heavy smog that often infests the Po plane. 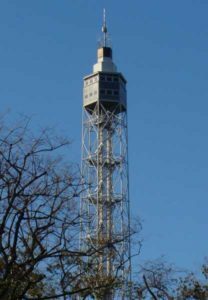 Constructed in 1933 within just two and a half months for the Fifth Triennial exhibition, the Torre Branca , all made of steel, with its 109 m is a kind of miniature Eiffel tower. 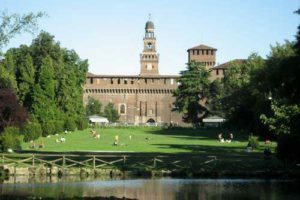 Accessible at the external side of the park it has a modern elevator, it offers a wonderful panorama over the park, the Castello and the city. The tower is property of the Branca family , who run a famous distillery for over 160 years. There is a museum on the firm’s historic industrial premises Via Resegone 2, (Mon/Wedn/Fri 10-3 reservation obligatory). There is a modern bar/restaurant at the base of the tower, from which one has a lovely view of the park. 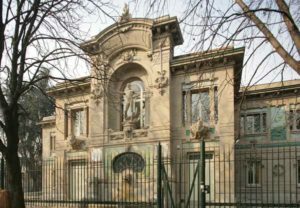 The communal aquarium of Milan, situated in a beautiful Liberty-style art nouveau building, is one of the oldest aquariums in the world. A spectacular transparent tunnel-bridge allows visitors to pass underneath the tank and admire the many different fish species from every corner. The aquarium has multimedia library. The Municipal Sports Arena, named after the famous sports journalist Gianni Brera is a neoclassical building from 1807. Napoleon was present at the opening ceremony! The Arena is still in use for athletics, concerts and events and is the home ground of the Amatori rugby team . It can hold up to 30.000 spectators. In September each year the Arena is the venue of the Notturna di Milano, a European Athletics competition. The Loggia Reale , Royal Gallery, has a graceful five-arch portico and eight columns of solid pink granite. 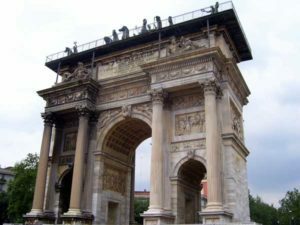 The Porta Trionfale (Gate of Triumph) has two doric columns on each side and bas-relief depicting the classical games. Completely accessible for the disabled. At the far end of the Parco Sempione is the imposing monument of the Arch of Peace , originally from Napoleonic times, but adapted after the defeat of the little emperor. The monument is richly decorated and the Chariot of Peace ( a so-called sestiga : a cart drawn by six horses) is a spectacular “topping”. Part of the decorations represent the rivers of Lombardy and the Veneto : the Po , Ticino , Adda and Tagliamento. Milan is world renowned for its shopping possibilities and you’ll find the most important streets and districts in this post. The most important (and expensive) shopping district, where all the major designer’s shops are, is the Quadrilatero d’Oro . Then there are the major shopping streets of Corso Buenos Aires , Corso Vittorio Emanuele , Corso Magenta , Corso di Porta Ticinese , Corso Venezia and the Galleria Vittorio Emanuele itself of course. The Brera and Navigli districts also offer a wide choice of shops. The largest and most modern shopping mall is the Piazza and Portello , further out north west of the city. If you want to go for an outlet store , the best choice (only by car or by bus tour ) would be the Serravalle Designer Outlet Center . They claim to be Europe largest! There is another large outlet at Fidenza near Parma (also possible by bus tour ). Closer to Milan is the Vicolungo Outelt Center that also offers a shuttle service from Milan center. What the Bermuda Triangle does for aircraft, the Milanese Rectangle does for your money: it makes it disappear into thin air. 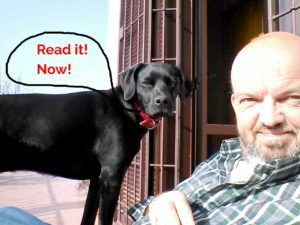 If you are tempted to buy, that is to say. Fortunately they invented the credit card, so you won’t notice (immediately). This high-class shopping district is home of the world’s major fashion brands , like Giorgio Armani, Dolce & Gabbana, Gucci, Viktor & Rolf, Prada, Versace etc. You’ll find jeweler’s, boutiques and design and furnishing showrooms. The sides of the quadrilateral are formed by Via Montenapoleone , Via Manzoni , Via della Spiga and Corso Venezia (sometimes it is also called the Triangolo della Moda , but is hard to see why). The district is not far from city center and the Poldi Pezzoli museum and Bagatti Valsecchi palace. The Giardini Pubblici are also close. In the district you’ll also find Caffe Cova one of Milan’s oldest and most fashionable, founded in 1817. From the north east corner of the Giardini Pubblici prolonging the Corso Venezia , the Corso Buenos Aires , the longest shopping street of Milan heads north for over a kilometer. The Corso Buenos Aires is a main artery of the city and has over 350 shops, with an emphasis on pret- a-porter instead of haute couture clothing ( 75 women clothing’s shops ). There are about 30 shoe shops. The main shopping mall of UPIM is also located here. There are 15 (wine) bars and a few restaurants along the way. Along the way you’ll have the possibility to visit the Museo Boschi Di Stefano and if you continue a little after Piazza Loreto you may visit the Santa Maria Bianca della Misericordia . At nr 33 is the recently reopened Teatro Elfo Puccini . Peculiarity : when the street was built, it flanked the old Lazaretto (part of the wall still exists), made famous by the novel I Promessi Sposi of Manzoni. From the Duomo to Piazza San Babila runs one of the important pedestrian shopping areas of Milan, the Corso Vittorio Emanuele , not to be confused with the Galleria Vittorio Emanuele at Piazza Duomo . The Corso is characterized by the porticoes that run along the whole street (nice in case of rain). Along the corso you’ll find a range of shops. There is also a mini version of the Galleria Vittorio Emanuele , the Galleria del Corso at the end. In between the Corso Vittorio Emanuele and the Corso Europa (east parallel) is the little church of San Vito al Pasquirolo . At the same height a little to the left on Via San Paolo is the Palazzo Tarsis . Right next to the Palazzo is the small square Piazzetta del Liberty with the peculiar modern building with the ex-Trianon facade pasted on it. In the new building you’ll find the one Ferrari store of Milan. With the MilanoCard you obtain a 10% discount in the shop. At the end of the Corso , near San Babila , is the church of San Carlo al Corso . From Piazza Cordusio (halfway from Duomo to the Castello Sforzesco ), starts the Via Meravigli to the west, which flows into the important Corso Magenta . This street offers a range of major sights of Milan: the San Maurizio church, the Museo Archeologico the Palazzo delle Stelline , now hotel and congress center the Palazzo Litta with the oldest theater of Milan, the Teatro Litta and last but not least the Santa Maria delle Grazie with the Last Supper of Leonardo. You’ll find over 10 wine bars, women’s clothing shops and several restaurants. Alongside the San Lorenzo Maggiore running a little north and mostly south is the shopping street of Corso di Porta Ticinese . This is the street to do your alternative shopping from little artisan-type shops, also second-hand. Right beside the Colonne di San Lorenzo there is the medieval Porta Ticinese . At the far south end there is another Porta Ticinese , the neoclassical one. Before reaching the end of the street you may want to visit the magnificent Sant’Eustorgio church and the Diocesan Museum . This important street starts off at Piazza San Babila and runs on for almost 1 km in north east direction. First it serves as the eastern border of the Quadrilatero d’Oro shopping district, then it flanks the Giardini Pubblici , to finally flow into another important (shopping) street, the Corso Buenos Aires . Along the way you’ll be able to admire and visit : Casa Fontana-Silvestri; Palazzo Berri-Meregalli (a bit east of the main street); Palazzo Serbelloni; Palazzo Bovara; Palazzo del Senato (a little west); Palazzo Saporiti; the Museo di Storia Naturale; the Planetarium Hoepli; the Porta Venezia. Across the Piazza Venezia/Oberdan at the end there is also the Casa Galimberti . From the Corso you can easily walk into the pleasant Giardini Pubblici and visit the Villa Reale . A complete overview of the shops at the Corso Venezia is available at the website of the street. You’ll find 7 wine bars, 14 women’s clothing shops, 8 shoe shops and a pizzeria-restaurant. Founded in 1990 by art gallery owner Carla Sozzani , the small art, design and fashion shopping center 10 Corso Como is now a well-known venue for socio-cultural events, among which the World Press Photography exhibition each year. Located in the inner courtyard of a traditional Milanese palazzo ,somewhat north of the Santa Maria Incoronate church, it also has a café , a bookshop and small hotel (called 3 Rooms ) to offer. There are also an on-line shop and an Outlet Store (at Via Tazzoli 3 ) connected to the 10 Corso Como company. Connecting the square of the Duomo with Piazza della Scala , the Galleria Vittorio Emanuele II offers a wide range of luxury shops, bars and restaurants where you can spend a lot of money if you wish. At the Town House Galleria Hotel you can stay at a price of 900 up to 3000 euro a night. All shops, even McDonald’s, are obliged to have their names written in gold on black on their windows to guarantee visual uniformity . The glass and steel constructed roof and cupola date from the late 19th century and the mosaics in the floor represent the weapon of the House of Savoy, the different capitals of Italy (Milan, Turin, Florence and Rome) and allegories of the four continents. The statues in the gallery represent Leonardo da Vinci, Michelangelo, Galileo etc. Tradition has it that turning in circles with your heel on the vital parts of the bull in the center mosaics brings you fortune, though the precise details on how to do it differ (so if it doesn’t work, it’s your fault). The Galleria is frequently called the salon of Milan as it is a favorite meeting place for the inhabitants. A little east of the Castello Sforzesco and a little north of city center lies the Brera district . From the 19th century on this has been the area where artists, writers and the like would live and meet. It has now become more of a touristy spot, but is still worth a visit as it is lively and offers a large number of shops, bars and restaurants, antique shops in its narrow streets. In the district you’ll find the most important art museum of Milan, the Pinacoteca di Brera and it also houses the office of the Corriere della Sera , the quality paper of Italy. An antique market is held in Via Fiori Chiari every 3rd Sunday of the month. Brera is the name of few famous Milanese, but the name of this district very probably originates from the Lombard medieval word Braida , which means meadow, braidense still being the adjective of Brera. The Navigli district was a system of five navigable canals around Milan. The area of the city where the now remaining Naviglio Grande and Naviglio Pavese are located is known as the Navigli (or Ticinese , after the Porta Ticinese ) district. The district is mainly known for its lively evening atmosphere , when it’s bars, cafés, enoteche , restaurants and music venues are flooded with tourists and Milanese. Traditionally it has also been the district of antique shops and markets. Apart from eating and drinking and shopping, you may also admire some of the cultural sights of the area: S.Maria delle Grazie al Naviglio Vicolo dei Lavandai the Stone Bridge on the Naviglio Grande the iron passerella footbridge on the Naviglio Grande San Cristoforo the historical courtyards of the Navigli In terms of museums and venues the district has on offer: Scala Ansalda Laboratory Fondazione Arnaldo Pomodoro Auditorium di Milano Museo Diocesano Museo Pecci Enough for a day’s and evening’s amusement! It is now also possible to take a boat tour on the Navigli , from April-October, different itineraries possible, price range 15-65 euro. The trips are run by the Navigli Lombardi association (Tel. 02 33227336). 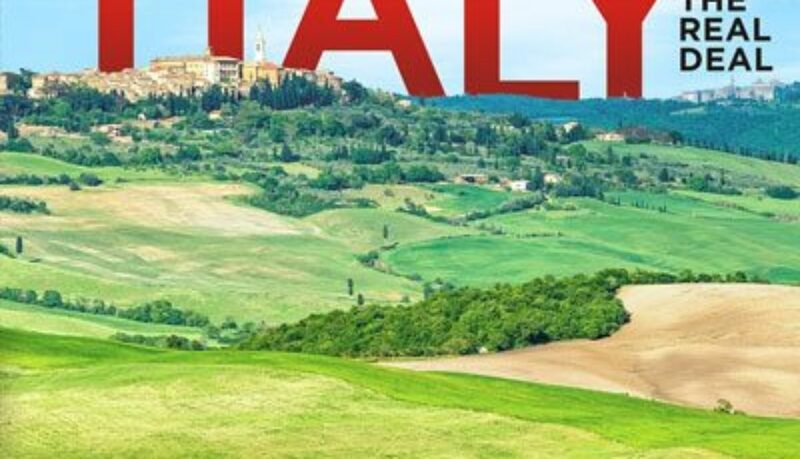 In the North West of the city, near Monte Stella , you may want to visit a small city’s worth of shopping, called Piazza and Portello . On the location of the former Alfa Romeo factory terrain architect Gino Valle designed this modern shopping mall. See the website for the shops and facilities present. The entire Portello district is in development with modern residential buildings and offices. In 2012 the largest square of the whole of Milan will be ready with an automatic car park underneath and connected to a 65.000 sq m spiral sculpture park with a spectacular artificial hill. About an hours drive from Milan lies one of the largest Outlet Centers of Europe, the first of its kind in Italy, the Serravalle Designer Outlet . This a small city’s worth of shops (180 in total) selling the stuff of about all brands around. Clothing, shoes, bags, accessories, jewelery, make-up and even Hi-Fi and sweet and chocolate can be bought here at prices 30% to 70% below the official ones. A lunch break or refreshment can be had at one of the bars, the fast food restaurant, the gelateria etc. In case you don’t want to go there by car or train, there is the convenient bus shuttle service offered by Zani Viaggi . It departs from the Zani office at Foro Bonaparte ( Largo Cairoli at the Castello ) at 10am and arrives at the design center at 11:30 am. Return at 5pm. Cost 20 euro p.p., children (4-14) half price. Book at the Zani office, tel. 02867131. For shopping lovers we suggest a visit to the Fidenza Village Outlet between Piacenza and Parma at about an hour from Milan. The Village has 100 boutiques of the most prestigious brand and offers discounts up to 70%. The brands available are: Armani , Valentino , Missoni , Paul Smith, Cavalli , Dolce e Gabbana and much much more. An overview of all brands is available at the website. The Village website has an overview of all offers on sale. There is a tourist info point at the Village with a DHL parcel service. Non-EU visitors can arrange for a VAT refund (tax free shopping). From Milan there is a a daily Autostradale bus connection that departs from Piazza Castello at 10.00, arrives at 1:30 and return at 6:30.